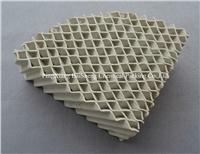 Ceramic Corrugated Packing consists of many packing units of similar geometric design. Corrugated sheets placed in parallel form cylindrical units called corrugated tower packing. 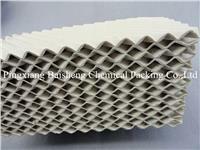 These are a form of highly efficient packing with separating efficiency several times higher than that of loose packing. They have the qualityof low-pressure drop, increased operating elasticity, minimum amplifying effect, and maximum liquid treatment compared to random tower packing. The obliquity for X type and Y type is 30. and 45. respectively. 1) High capacity. New tower design may reduce diameter, while renovate old towers may increase capacity significantly. 2) High separation efficiency. Since it has much larger specific surface area compared to random packing. 3) Low pressure drop, which leads to reduce energy consumption largely. 4) Large flexibility, and scale effect is not obvious. 5) Suitable for all tower diameters. 6) Strong resistance to corrosion of acid and alkali, especially to H2S, naphthenic acid and Cl- . 2) Rectifying and absorbing some corrosive mixtures, which are definitely regulated in pressure drop and theoretic plate number. 3) Applied in some towers that contain a large quantity of natural media used to absorb nitric acid and concentrated sulfuric acid, as well as for purifying the air in chemical plants. 4) Operating in vacuum conditions at a bottom absolute pressure of 100pa. 5) Used in heat exchanger and demisting, or as a catalyst carrier.